Fiber Flux: Free Knitting Pattern...Super Pink Toddler Hat! 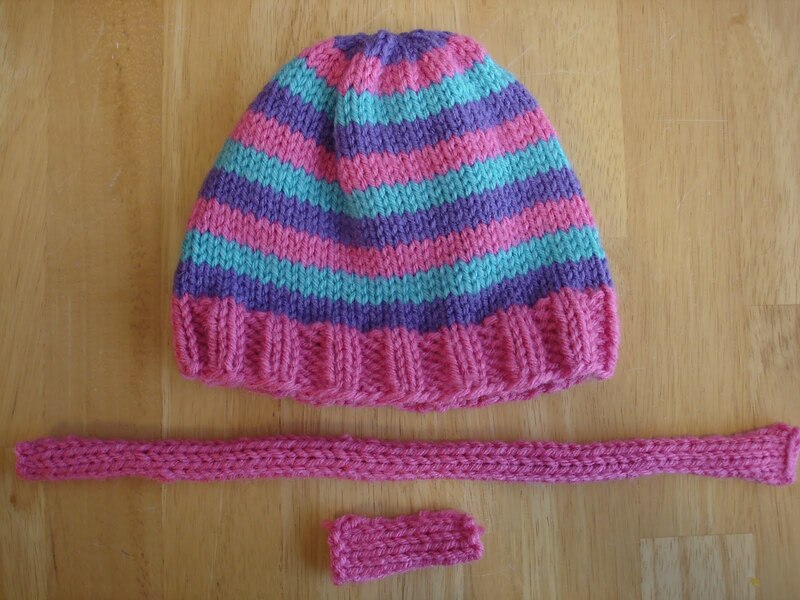 Free Knitting Pattern...Super Pink Toddler Hat! Super Pink is a super girly toddler hat for your little diva. Knit in the round and finished with a sweet bow, it will keep your toddler warm and fabulous. 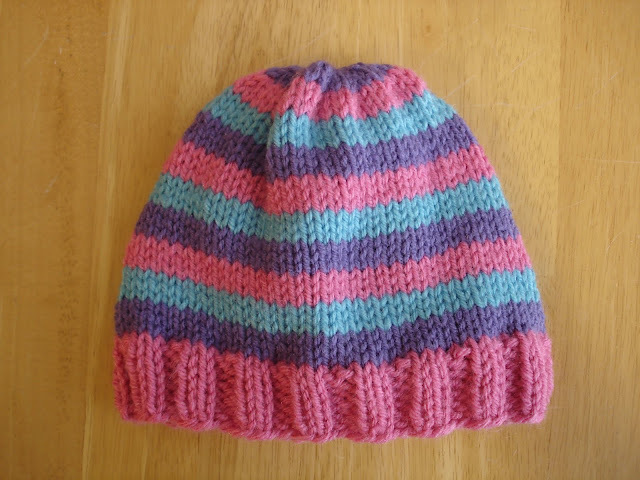 Work in st st (knit each round) until hat measures 6.5” from CO edge, switching colors for stripes as desired. 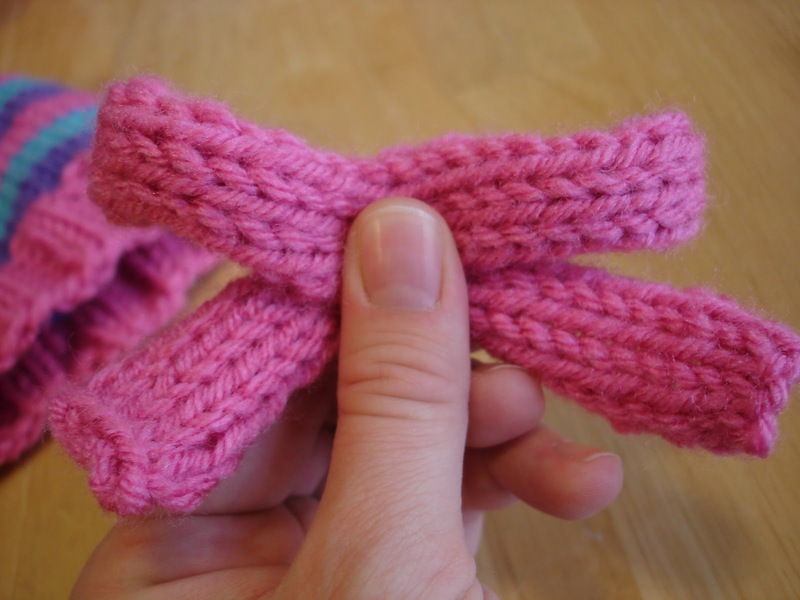 Bow is knit in two parts—1 long piece for side loops and tails, and 1 short piece for center band using US8 needles. 1. Make a loop and pinch in the middle. 2. Carefully twist the two tails so that the stockinette side is facing out, while still holding it in your hand (this gives the bow a more uniform appearance with RS facing out on both loops and tails). 3. Attach to hat in the middle with a stitch or two to hold it down and free up your hands. Then tack down loops and tails with a stitch or two each (I didn't completely sew down entire bow, just a few well placed stitches to keep it looking three dimensional. 4. Finally place center band around bow and stitch to hat. Lovely! This hat is adorable! When did you use the circular needles? I made it with dpns(which I hate) so I tried to make another with the circular and it was too tight. I am a super beginner so that may have something to do with my difficulties! hi brooke easy enough to just use a bigger circular needle, or even the straight needles. calls for 8 use 8 1/2. i make preemies and send them to the charity causes. When you join your knitting in the round (after the first row) be sure that all your stitches are facing the same direction. I lay my work flat and put all the worked stitches to the "outside" of the circle. 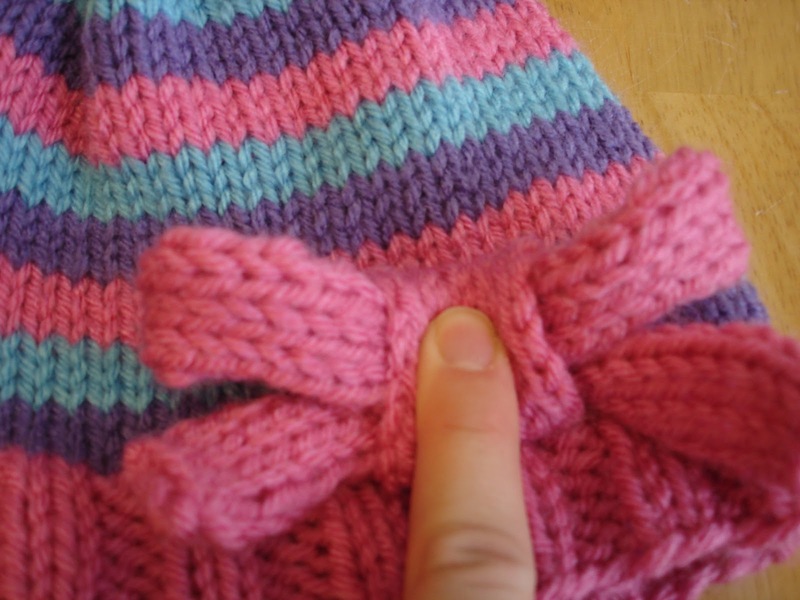 Once you do that the first time, the rest of the stitches will face the correct direction and not be twisted. 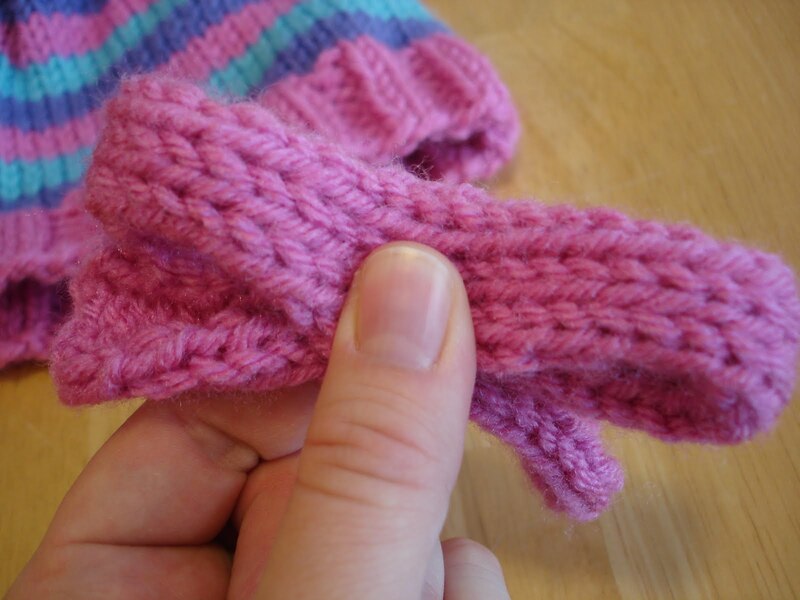 Be sure the mark the first stitch of the second row with a stitch marker so you will not loose your place. The Sheep and Stitch website does a great job of explaining this. Look at the "knit a big hat" tutorial. She is really good. Hope this helped. Just located this adorable hat. Hope this will be the hat size for her. Thanks! I went as far as I could with the circulars before switching...I remember knitting a lot tighter when I was first learning too...please let me know if you have any other questions and happy knittng!! what yarn did you use to make this hat? hi peg u really can use any type of yarn to make anything!! just use the needle size the yarn call for on the package wrapper it comes with. another tip. i am an aDvid knitter for everything !! so this is how i come out with a perfect size item. lets say the hat is for a child. eg.. CO 30 STS. SO I MULTIPLY THE SIZE OF . HEAD 16" TIMES BY THE STS. ON THE NEEDLE TO MAKE AN INCH. what yarn did you use to make the cotton candy hat? Thank you. When washed it is surprisingly soft but still retains its shape well. For the Cotton Candy Hat I used Red Heart Super Saver in Bon Bon print and Red Heart Super Saver in Shocking Pink! That sounds adorable! Very creative! Try using Google Translate...it is a wonderful tool. As for the "extra" things printing...try highlighting needed text and then pasting it to a word document. That way you can save it too and only get what you absolutely need! Hi Jennifer. Thank you for sharing these kid hats with us. I'm glad to have the preemie hats patterns for donations. So great of you! You're welcome...knitting preemie hats every March and April is one of my favorite things to do as a knitter...it warms my heart! I've just started knitting this hat but it is coming up really small. The size says 1-3 but the size I'm knitting for looks like it's a newborn or preemie. Have I read the sizing wrongly? Hmmm, how is your gauge measuring? If not measuring the same, perhaps go up a needle size or two? Also, if you need to, you can increase the number of cast on stitches to make the hat a little bigger, just be sure to increase in groups of 4 so the decrease section works out correctly...hope that helps! PM and join in the round, being careful not to twist. Please tell me what this means, and how to do it. Thanks. I'm really looking forward to making this for my granddaughter. Hello! As I was reading your directions, I was also looking at the hat--- the last few rows of the directions have you knitting each row.. This wouldn't give you a stockinette stitch, would it? and the hat looks like it's in stockinette stitch to the very top. Would it be better to K2, Ktog on one row, then purl the next row? Hi Jennifer. I love this pattern. Quick question, though, do you only need to decrease in six rows or am I missing something? In your picture it looks like you are decreasing in each of the three colors, but the pattern seems to indicate differently. Thanks in advance.! Ps I'm making it in navy, ivory and red for my one year old daughter...but doing three rows of the navy and ivory with one row of the red...the bow will br on red! Hopefully it looks as cute as yours!! You're absolutely correct! I wanted to keep the stripe sequence, that's why I put "stripe sequence as desired" However, I'll add a little note in the decrease section too...hope that helps! Sorry for any confusion. *Simply drop one color and pick up a new color, it will look a little loopy and loose, but give it a few gentle tugs as you go and it will straighten out. *You could cut the yarn and and then tie on a new color. If you want to get fancier, check out knittinghelp.com for several more ways to change colors and/or join new yarn to your project. When you're all finished, weave in any ends. Thanks for your question! Jeannie below answered below, couldn't have said it better myself. Thanks Jeannie! I copy/paste these patterns to my email - hilite - click on copy up under edit - then go to a new compose email - click on the body - click on paste - then send it to myself. When I print - I tell the printer what part to print and all I get it the pattern. Sounds complicated, but really isn't. Anonymous - 4 us8 cpns means 4 size 9 double pointed needles - US 8 16 circ needles means a size 8 circular needle 16 inches long. WalMart usually has them. hey um if i make the bow on a hat of my one making can i use the bow and i was wondering if i could sell it. Hi, I appreciate you asking me...are you selling just the bow, the bow and hat or multiple hats? I guess I'm confused? Well, i want to no if i can put the bow on a hat i make and still sell it, or if i put it on a clip and sell it like a hair piece. I am somewhat new to knitting and am having a bit of difficulty with this pattern. I have used circular needles before to knit bags, without any trouble, but each time I try to make this hat, regardless of how much I tighten up the yarn, there is always a hole in the pattern where the joining takes place. Usually my bags will start out with a small hole such as this, but quickly close up after a couple of rounds. When I try making this hat, the hole is much larger for some reason, and does not close, instead creating an open "ladder" the entire length of the hat. I made one hat, going back to stitch up the opening after the pattern was completed. It came out cute, although the seam is noticeable and not as neat as I'd like. I would like to make another hat, but don't know how to avoid making the mistake again. Does the first row have to be knit only, and then do I start the knit/purl ribbing on the second row? Any advice would be helpful. Thank you! Thanks for your question! 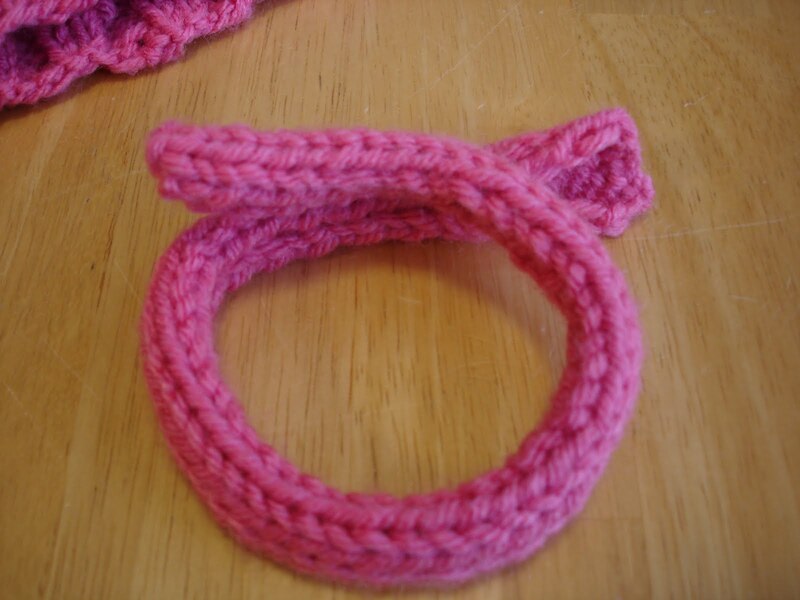 When I am knitting in the round, when starting a new round, I'll give the first few stitches of the round each a gentle tug by carefully pulling on the yarn that is in my hand. So I'll knit the first one, tug, knit the next, tug and so on. This helps a lot with laddering. It can get somewhat loose if I don't do that. As for the question about the ribbing, I would stick to the ribbing for the first rounds, I think doing a knit round to start would make the hat loose the elasticity it would need to a snug fit. Sometimes purl stitches can be looser than knit stitches, you could try making the purl stitches a bit more snug too. One question for you...what length circular needle are you using? If the needle is too long and the piece has to be stretched around the circumference of the circular needle, it can also pull things apart a bit and be more difficult to work with. It doesn't sound like that's what you are doing, but I thought I'd mention it anyway. I hope I have helped! Good luck! Thank you so much for responding. I am using US8 16" circular needles, and I am careful to keep the yarn taut, especially where the round is joined, and yet I'm still ending up with the hole and the laddering. I'm baffled! As I mentioned before, I've used these needles to knit several bags and never had this problem, which is why I thought it was perhaps the difference in pattern (knitting and purling, as opposed to just knitting) that was throwing things off. 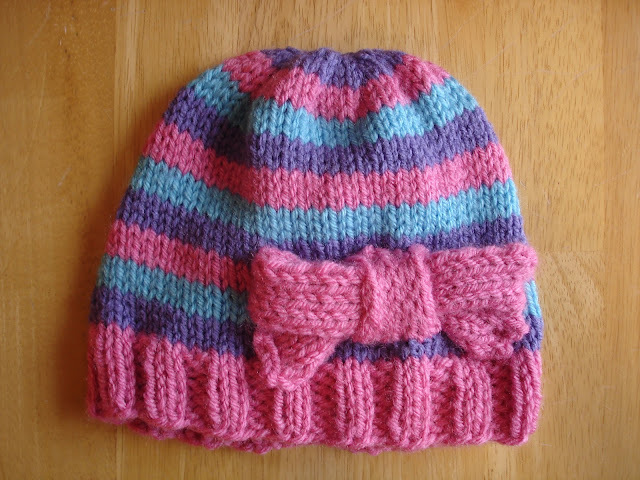 It's such a cute hat (I left off the bow, but stitched a pink pompom on top) and I really want to make it again. I'll keep trying until I get it right! Thank you again for sharing this pattern, and for taking the time to respond to my question and offer your help. I really appreciate it! You're so welcome, I am more than happy to help! Here is an article I liked on the subject...check it out, I found it to be really helpful! Curious how you are coming up with your gauge...24 st and 17 rows on number 8 to 4 inches isn't even close to a worsted gauge...before I get too far on my project want to be sure I'm not reading something incorrectly. BTW...your patterns are adorable. Thanks! You're welcome! And not sure about your gauge, perhaps try experimenting with a different needle size...sometimes I have to do that too. Hi Jennifer i was wondering if i can put this bow on a hat that i am going to sell. hello would it be possible to make this little hat on straight needles? Thank you for this pattern. I have a great niece that this would look so cute on. Tip: When I print patterns off I also go to the comments and read them. When a comment has a question and you answer, I copy and paste it to the pattern so that if later I have any problems I can read them and get answers. Hi Jennifer, thank you for sharing your pattern. My question is: how do I attached the bow to the hat? Needle and thread? Tapestry needle and yarn? Jennifer, my other question about the bow is: how do I get the long piece to stay flat, as the edges curl. I'm new to knitting. Thank you! I'm making the hat and I was wondering why the pattern says to use st st(knit every row) but st st is knit one row and purl one row, knit every row is garter..right? Looking at the hat, it is done in knit one row purl one row...Thank you for your help! Jennifer, I'm further up on the hat and I see you do have to knit every row to make it right..I believe this is the first time for me joining the round..Is it called stockinette stitch for working in the round(every row is knitted) and back and forth in rows too? Stockinette stitch is knitting one row and purling the next row..Right? That is confusing for me..It's not anything you did..I'm still learning! I love this hat! I have 2 great grand girls..One is 14 months and the other is 3 years old..They will love it!! Easy to follow. Thank you for a fast and simple pattern.